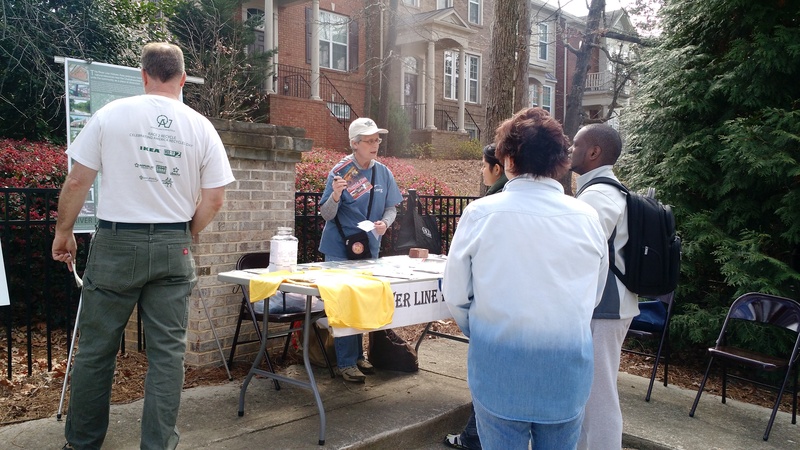 The distant past, the present and the future collided at Smyrna’s Shoupade Park as curious visitors learned the story of the Civil War’s most impressive fortifications and about a plan to extend a popular trail into the heart of Atlanta. The program is part of Phoenix Flies: A Celebration of Atlanta’s Historic Sites, created in 2003 by the Atlanta Preservation Center. 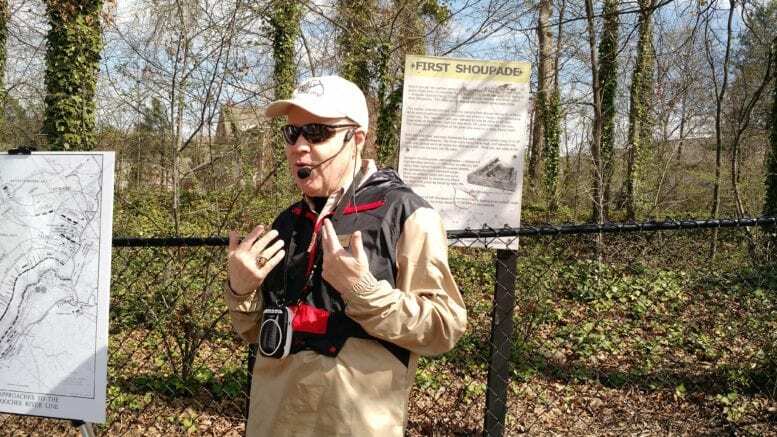 Kennesaw State University professor and historian Michael Shaffer offered much more detail during guided tours of the park, which is named for fortifications developed by Confederate Brigadier General Francis Asbury Shoup. Shaffer has given tours of the area as part of the event four the last four years. He’s also in the process of writing a book on Shoup, an Indiana native he considers one of the Civil War’s most fascinating figures. 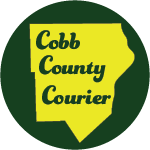 While officially a Cobb County park, it’s little more than a linear path sandwiched between two subdivisions. However, that small space is packed with history as it features the remains of two Shoupades. 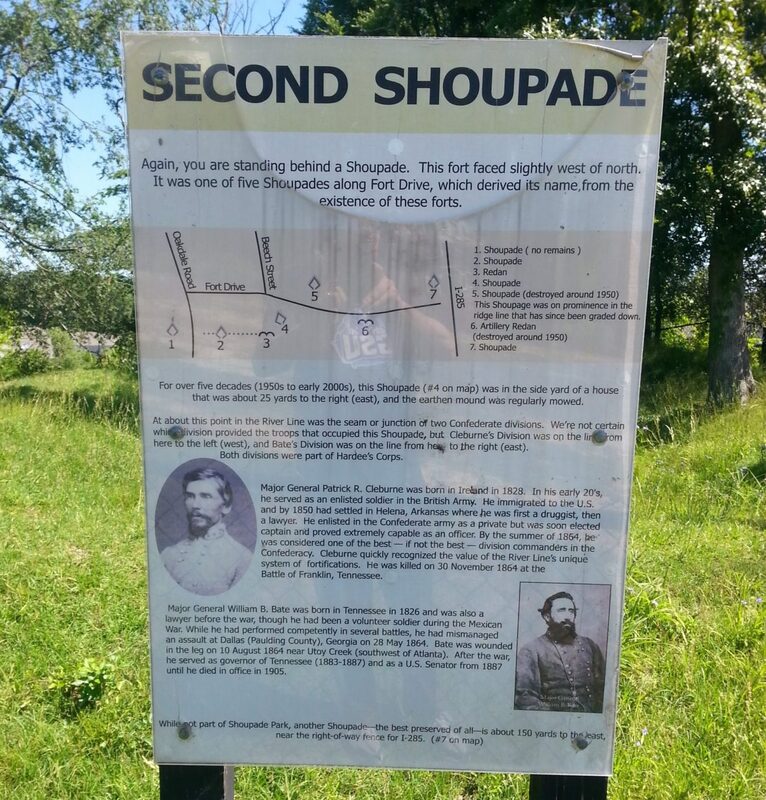 “Shoup was a brilliant man,” said Shaffer, who pointed out that Union General William Tecumseh Sherman described Shoupades as among the best defensive fortifications he’d ever seen. Constructed during a flurry of Civil War battles in the summer of 1864, the Shoupades stood 16 feet tall, could accommodate up to 80 soldiers and were shaped like an arrowhead. A total of 36 were constructed forming the River Line that was intended to keep Sherman’s troops at bay and out of Atlanta. The term “Shoupade” is a portmanteau of Shoup’s name and stockade. A force of over 1,000 enslaved African-Americans built the Shoupades in a matter of weeks. They needed to be strong and effective because the Southern soldiers were outnumbered two to one. Only nine survive, with five of those located on private property and four inside Cobb County parks. The ones that remain stand only a few feet high thanks to erosion. Pressure-treated wood did not exist in the 1860s and much of the wood used was repurposed for fences and other uses after the war. Sherman respected the engineering marvel of the Shoupades, but was able to find a way around them nonetheless. The general had been trying to circumvent Confederate troops during several previous battles and his tendency was to go to the left of the soldiers. This time he went to their right, successfully crossing the Chattahoochee River near Roswell and moving toward Atlanta, which fell on Sept. 2 as the war began to draw to a close. Shoup became a professor at The University of the South and lived much longer than most of his contemporaries. It was after the war ended that his unique design became known as a Shoupade. At the entrance to the park, volunteers waging a much different kind of battle handed out brochures and sold t-shirts for Connect The Comet, a group aiming to extend the Silver Comet Trail into Atlanta. The Silver Comet Trail was converted from old railroad tracks once utilized by the Silver Comet train. It runs 61 miles from Smyrna to Alabama, but the original train tracks extend six miles further east into the City of Atlanta. The group wants those unused tracks to become part of the trail as well. “The mission of the River Line Historic District is to preserve historic and natural resources,” said Cook. “This is more of a transportation issue, which is why we started Connect the Comet. Cook said most of the visitors she talked to Saturday were locals and that the group had gotten a good response from attendees. The River Line Historic Area is also hoping to raise $1,300 to replace damaged signs inside Shoupade Park. Connect the Comet volunteers could also be seen a few hundred yards further north on Oakdale Road waving signs in front of railroad tracks they hope to see converted into a portion of the trail. The tracks had been overrun with vegetation until Connect The Comet volunteers cleared it out earlier this year. Anyone who’d like to learn more about Connect The Comet and Shoupade Park can check out the program as it runs again next Saturday, March 18, from 11 a.m. to 3 p.m.
Be the first to comment on "Past, future on display during Phoenix Flies event at Shoupade Park"